Jayson Werth garden gnomes were a huge hit when the Nationals staged a giveaway of the gnomes this summer. Those who missed out on getting a gnome friend of their very own have another chance -- and some of those gnomes come with a huge surprise. 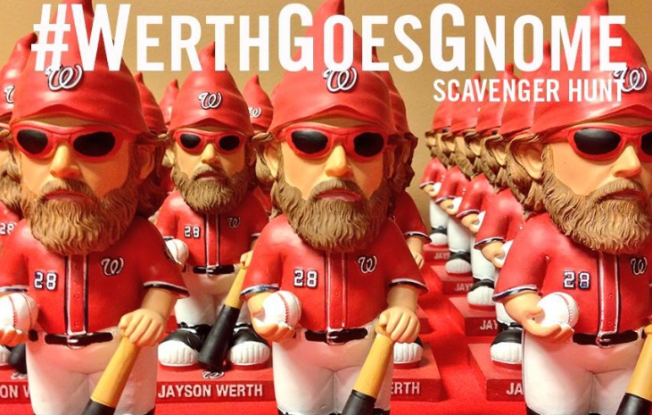 By 6:30 a.m. Thursday, the Nationals had hidden almost 100 Jayson Werth gnomes all over the D.C. area. Six of them are autographed, and the lucky fans who find those autographed gnomes will each score a pair of tickets to Game 2 of the NLDS this Saturday. The Nats are encouraging fans to search for the gnomes and tweet their photos using the hashtag #WerthGoesGnome and tagging @Nationals. There were still some out there as of Thursday evening. If you find one, let us know as well! Just add @nbcwashington to your tweet.